I’m interrupting my stream of Christmas projects to bring you a cute baby card! I had the joy this weekend of attending a baby shower, so of course I had to create a special card. 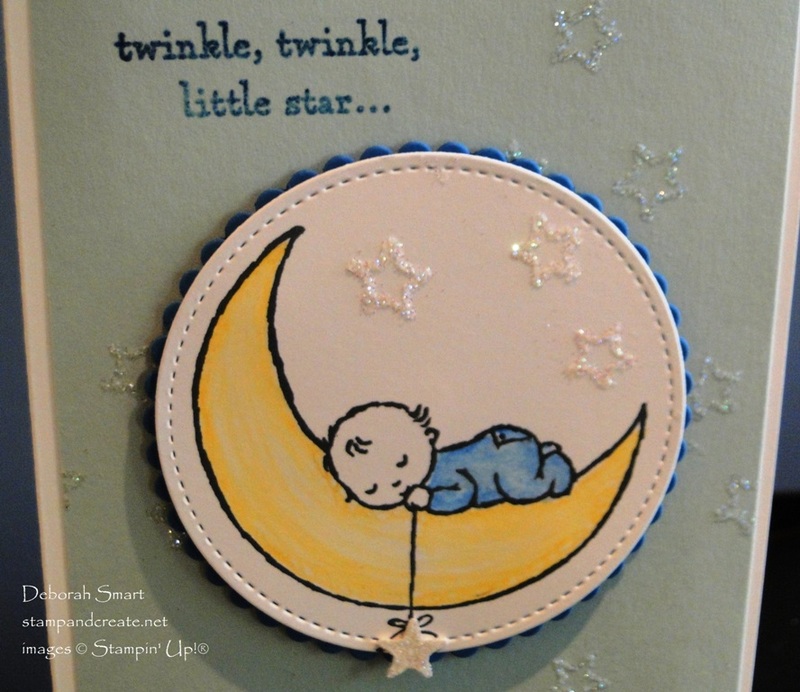 I used the sweet Moon Baby stamp set, found on page 106 of the Annual catalogue. The new baby is a little boy, so I brought out my blues, and went to work. Little babies are always adorable, but most especially when they’re sleeping, don’t you think? The little baby from the Moon Baby stamp set in this image is no different. I first stamped the image in Memento Black ink onto Whisper White cardstock. I decided to designate it a ‘boy’ by colouring in the sleeper with the Pacific Point Watercolor Pencil and a Blender Pen. After colouring the moon with the Daffodil Delight Watercolor Pencil and Blender Pen, I die cut it with the Big Shot and Stitched Shapes Framelits. The sentiment was stamped onto the Soft Sky cardstock panel by inking it with Versamark ink and Pool Party ink, and heat setting Clear Embossing Powder on top of it. 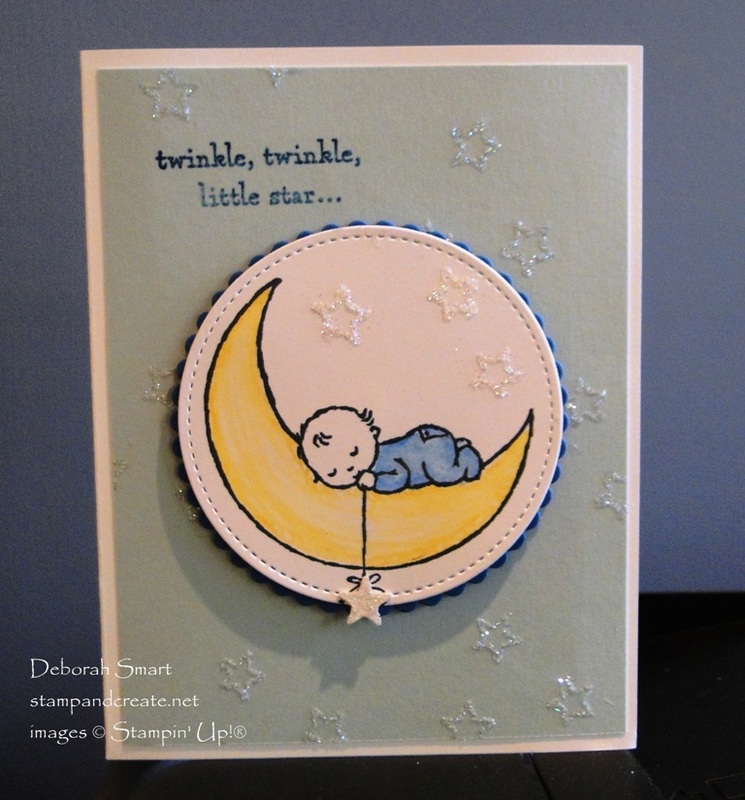 I really wanted some twinkling stars to go with the sentiment, so I stamped the trio star image in Versamark ink randomly on a panel of Soft Sky cardstock, and once on the die cut image. I then used my stash of retired Heat & Stick powder to cover the Versamark, and set it with my Heat Tool. This causes the Heat & Stick Powder to become like a glue, which I covered with Dazzling Diamonds Glitter, then set it again with the Heat Tool. I really wish Stampin’ Up! hand’t retired the Heat & Stick Powder! You can use the Glitter with liquid glue, but the H & S powder was great to use with stamped images. This close up picture shows how twinkly the stars look! I wanted the die cut image to stand out a bit more, so I layered it on top of a scalloped Pacific Point cardstock circle, die cut with the Layering Circles Framelits and the Big Shot. After layering them together onto the Soft Sky panel, I die cut a small star from Dazzling Diamonds Glitter cardstock. I used the stars edgelit in the Mini Treat Bag Thinlits for the small star. The star was attached using a Mini Glue Dot, and the rest was attached with Stampin’ Dimensionals. I forgot to take a picture of the inside of the card before I wrote in it! On the inside, I finished the outside sentiment with the stamp that says ‘do you know how loved you are’, and some stars from the Enamel Shapes. Oh my gosh, that is the cutest card. I love the sparkly stars in the background and the hanging star. It is just adorable! Such an adorable card, Deborah!